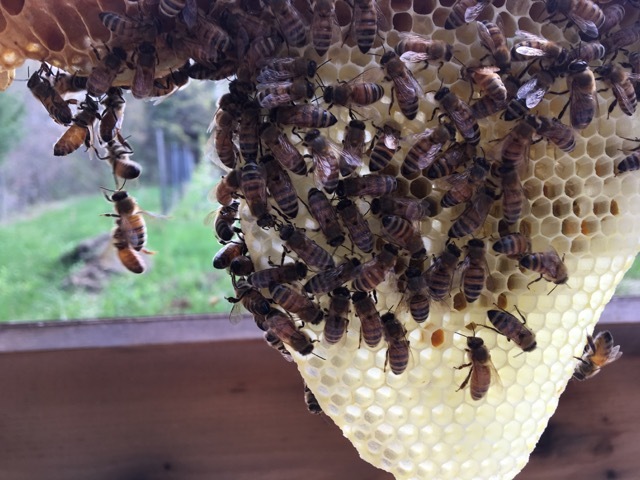 On May 8th it was a great day to get back into the hives. The weather was warm and sunny. 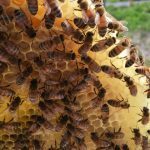 The bees were all very active and enjoying that more forage is becoming available to them. 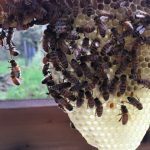 All of the hives are pleasant to work with and the bees are very calm. 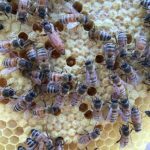 These colonies are growing quickly and needing more space each time I open their hives. 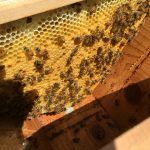 Today I got to see something that I have not seen in the past three years that I have been beekeeping. 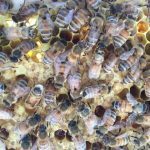 In every hive, I got to see several worker bees excreting wax from their wax glands! 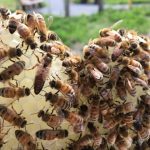 It was so exciting to see this and I couldn’t believe how many bees I saw excreting wax today. It was such a treat to see this and I am so glad that I pay close enough attention so that I know what is happening. 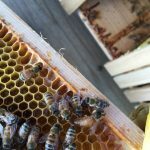 I started at the Healing Hive. These bees seem to be curious about me and why am am in their house. They are not agitated or upset, just checking me out. They had ten bars to build on and eight of those bars had brood at all stages on them. There were four bars with eggs and six bars with larvae the other two bars had lots of capped brood on them. 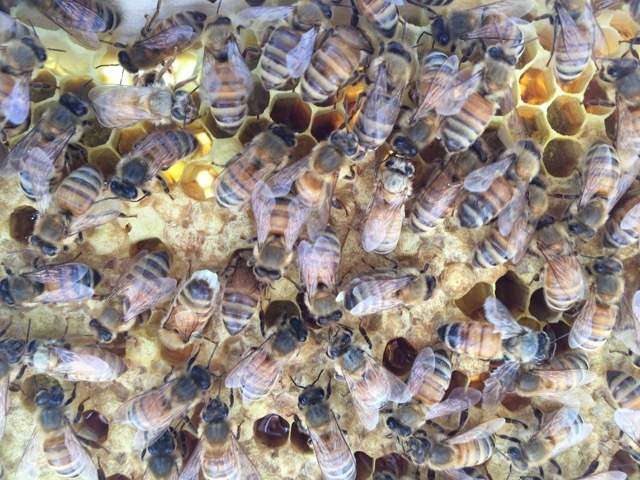 I was able to find the queen during this inspection. 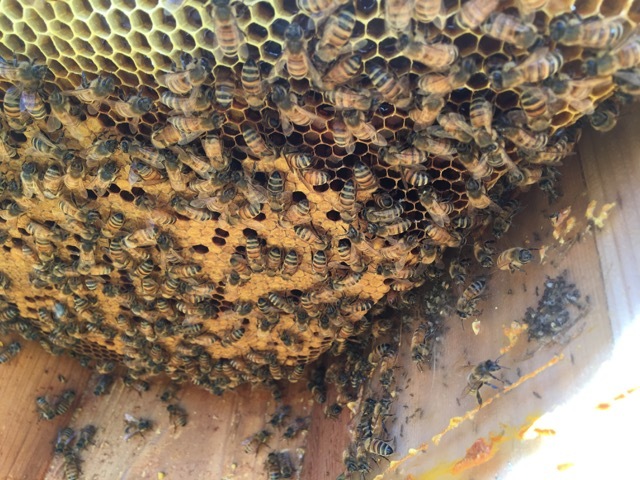 They have been working hard at foraging and had nectar on all ten of the bars. 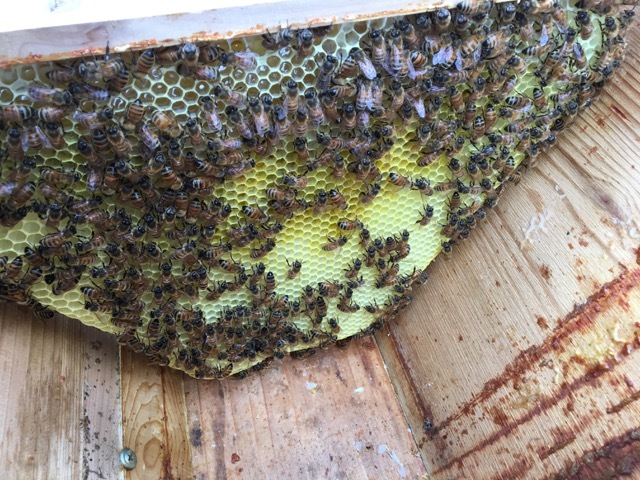 Pollen was stored on six of the bars. This colony looks very healthy and they are growing well. 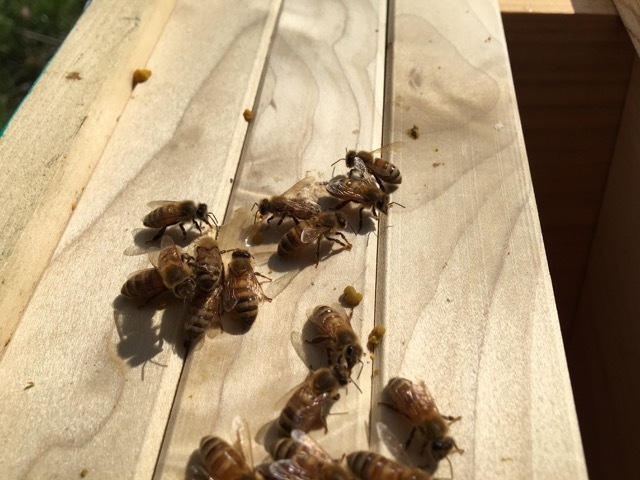 I found two queen empty queen cups on the comb. To give them more space, I added seven empty bars. When I added the new bars, I put the empty ones between full bars to prevent cross combing as much as I can. 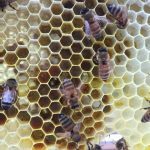 It seems to help the bees build the comb straight down when they have other comb to guide them. 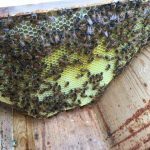 Now it’s over to Old Frog Pond Farm to start with the Orchard Hive. When I opened this hive there were two wasps nests in the lid, as well as a very large caterpillar cocooning there. There was also an ant colony in the observation window between the glass and the door for the window. To top it off, there were some strange looking beetles between the wall of the hive and the divider board. Luckily, they were not small hive beetles. 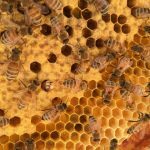 Lots of extra bugs in this hive today! Once they were all removed, I could finally start inspecting the bees. 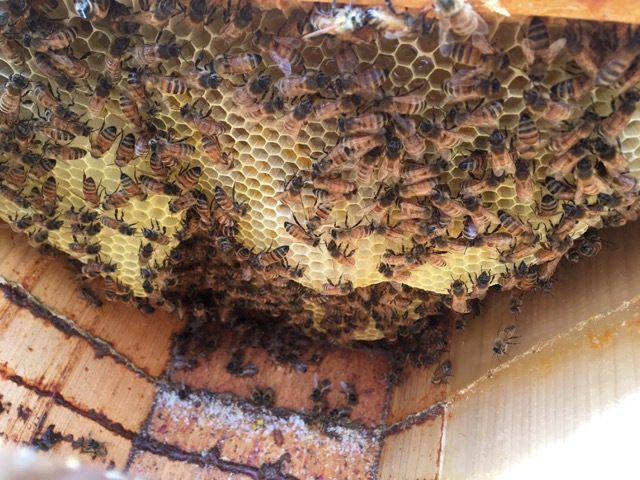 When I first opened the hive, I removed the divider board. 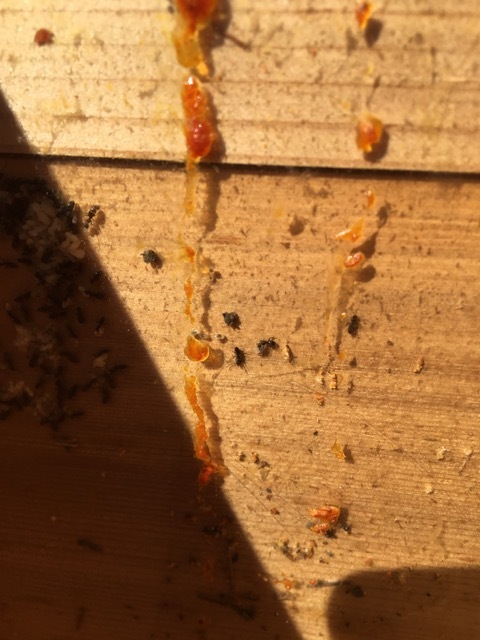 It let a lot of light into the hive and I watched the bees try to attack the ants. The ants were on the other side of the window, but the bees did not want them there. It was good to see them trying to defend their home, then if any ants do get in they will chase them out. 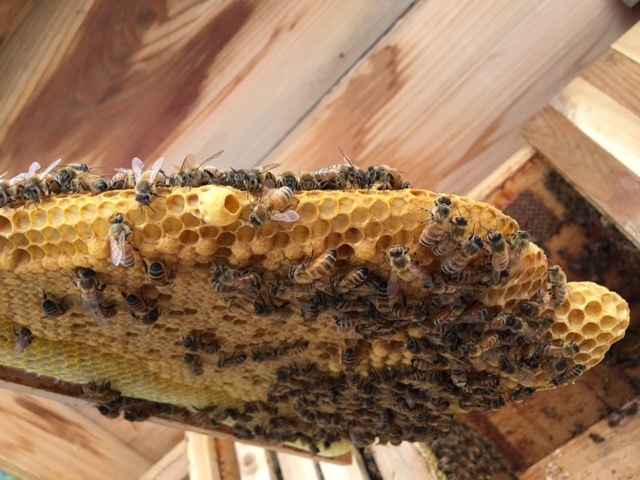 The Orchard Hive also had ten bars to live on and they were all full. 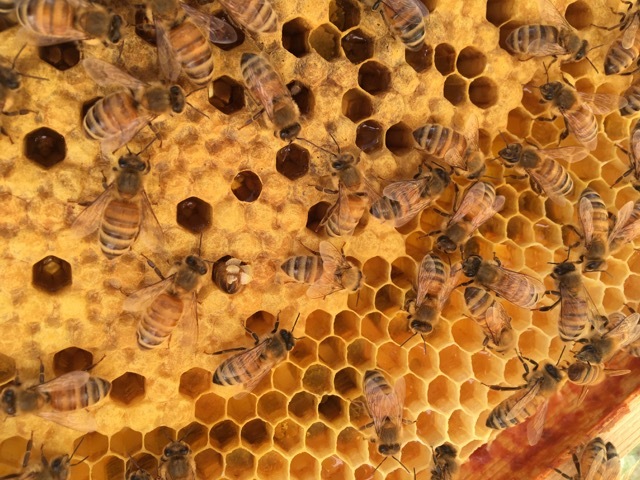 Nine of the bars had brood at all stages on them and nectar lining the tops of them all. 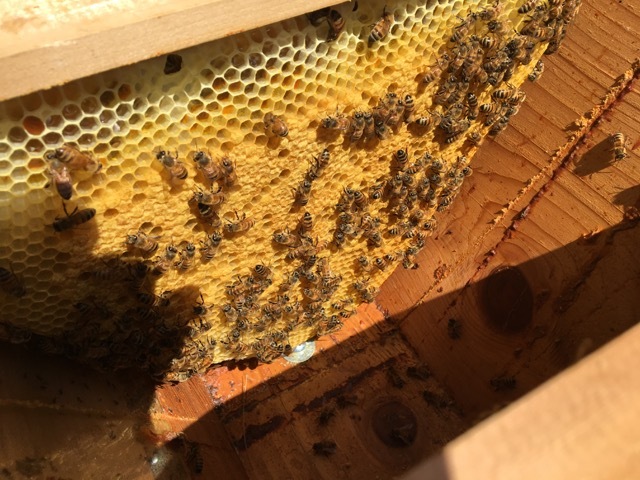 Ten of the bars had pollen stored on them, but only small amounts since the hive was filled with brood. One bar was still quite small, but had pollen and nectar on it. To give them more space, I added four empty bars. Not sure why I only gave them four empty bars, it seems there is no method to my madness. At the Willow Hive I got to start the inspection off by getting rid of a wasp building her nest in the lid. 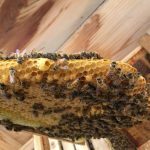 Once that was taken care of, I could open the hive. This colony looks and sounds amazing. 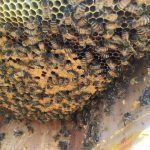 It is really important to listen to the bees when you are inspecting, there is a lot you can learn from the sound of the colony. 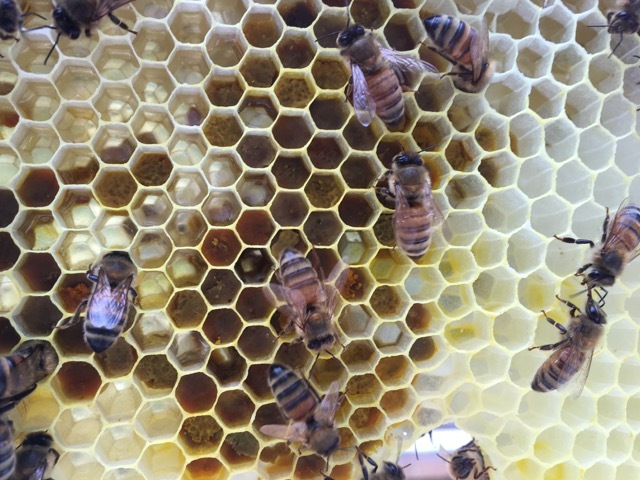 These bees just sound happy and healthy. Inside their living space there were nine bars and all of them are fully built out. 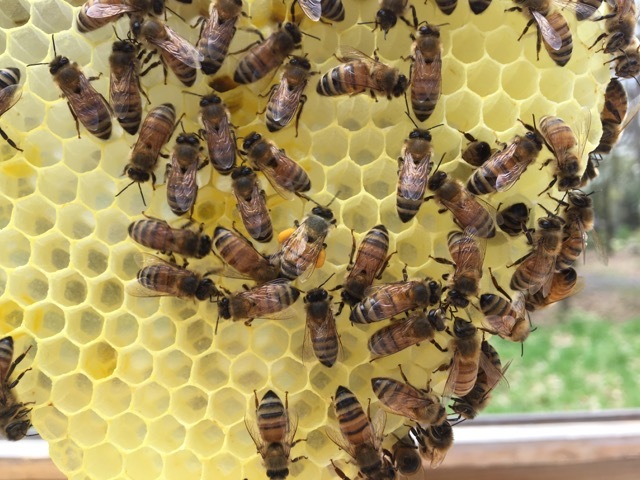 There is brood in various forms on every comb and a nice lining of nectar at the top of each one. 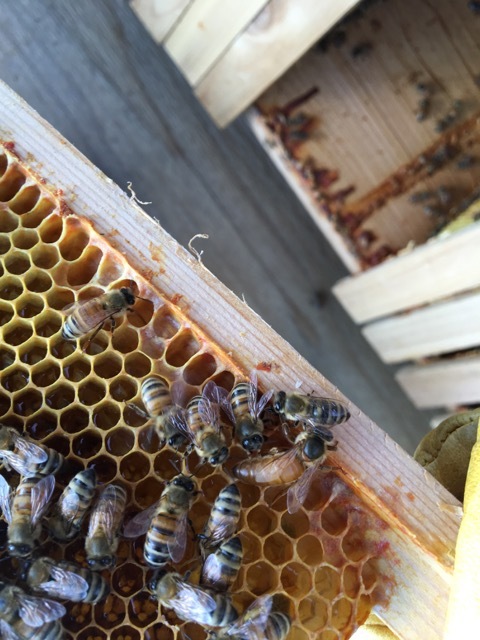 They have pollen stored on eight of the bars and I found four queen cups. 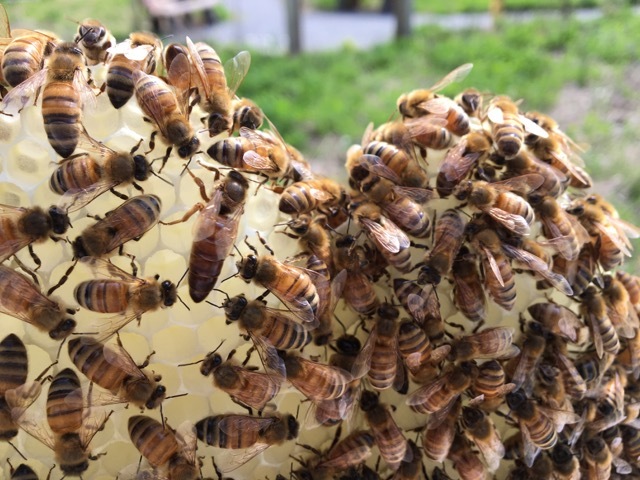 The queen cups were all empty, but they are growing and they are preparing. I did not see the queen during this inspection, but there was plenty of evidence of her. So they can keep growing, I added six empty bars for them. Once I finished at the farm it was time to head out to The Maynard Honeybee Meadow. This colony had a bit of a slow start. They have not been consuming the syrup that I have been feeding them, but there is more forage now. 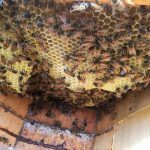 This hive is built differently, so the lid is tighter than the other hives which seems to help keep out unwanted pests. No wasps nests to deal with in this hive. Since they are not taking in the syrup, I removed the feeders. 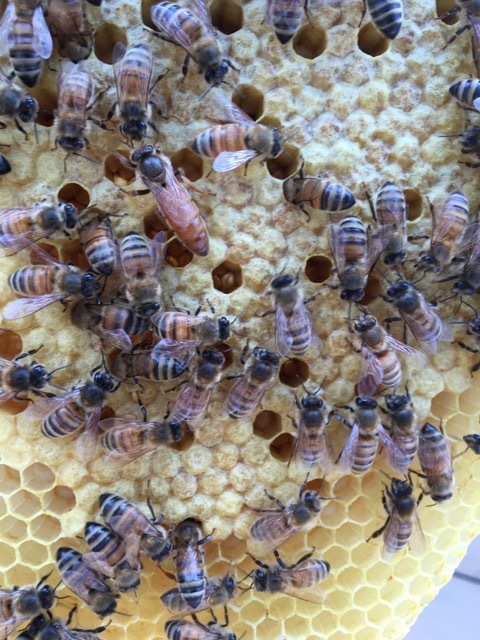 Another colony with ten bars and all of them had fully drawn comb. 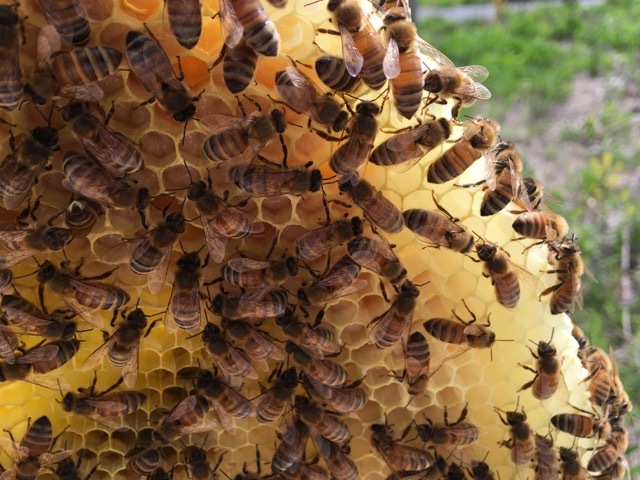 Nine of the bars had pollen and nectar on them. Eight of the bars had brood in various stages. There were eggs on three of the bars and larvae/capped brood on six of the bars. The two bars that were added during my last inspection were now fully drawn out and full of eggs. In this hive, I did get to see the queen. She was hiding from me and I found her on the last bar. 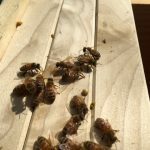 This colony has not built any queen cups yet and I added six empty bars to give them space to grow. I am relieved that they are looking as good as they do since they were not taking the syrup. 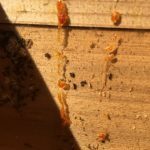 They have managed to build up their hive and are now collecting much better stuff than what I can feed them. 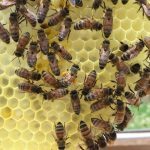 All four hives looked and sounded great. They are all off to a wonderful start and growing beautifully. Hopefully that is a sign of a good season to come. After spending all afternoon in my bee suit, I was ready to get home and cool off. It gets warm in that suit with the gloves on. I am still no where near ready to wear anything less than my UltraBreeze suit of armor. At least right now all of the colonies are very easy to work with.